Introducing our settled Minister. . . the Rev. Steven Protzman! Called by a unanimous vote by the Active Members of the Unitarian Universalist Church of Kent on May 27, 2018, the Rev. Steven Protzman began his ministry with us on August 1, 2018.
is a native Midwesterner and grew up in Missouri and Iowa. He holds an undergraduate degree in architecture from Iowa State University and his previous career was as a pipe organ designer for several major American organ builders. 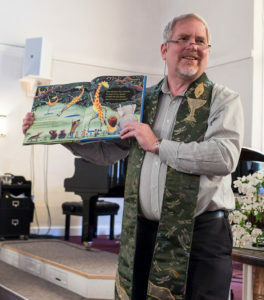 He is a 2009 graduate of United Theological Seminary of the Twin Cities, New Brighton, Minnesota and was ordained in 2010 at the First Unitarian Society of Minneapolis. Steven has served the Unitarian Universalist Society, Coralville, Iowa (previously the Unitarian Universalist Society of Iowa City, Iowa) since 2011 as its settled minister. Steven is an outgoing extrovert who loves to socialize and meet new people. He is also passionate about nature, especially wolves, eagles and the Columbia River Gorge in Oregon, is an avid country western dancer, and enjoys gardening, the arts, hockey, good food of all kinds, architecture, and exploring new places. While in Iowa, he rediscovered the rugged beauty of southern Missouri and northern Arkansas and vacationed down there for several years, exploring caves, rivers, forests, springs and the natural beauty of that part of the country. Steven believes in the power of Unitarian Universalism to transform people’s lives, to invite us to discover our fullest, most authentic selves, to guide us into deeper relationship with the Holy, and to challenge us to offer our lives in service to a world that needs the love and the gifts each of us has to share.